Press the dough into a 14-inch circle on a baking sheet. 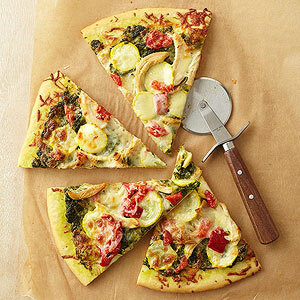 Spread the basil pesto evenly over crust. Top with chicken, shredded cheese, summer squash, roasted red pepper. Bake in a 500 degrees oven for 12 to 15 minutes or until cheese is melted and crust is golden brown.